It’s a headless, neckless, one-legged and one-armed Glossy Ibis skeleton! 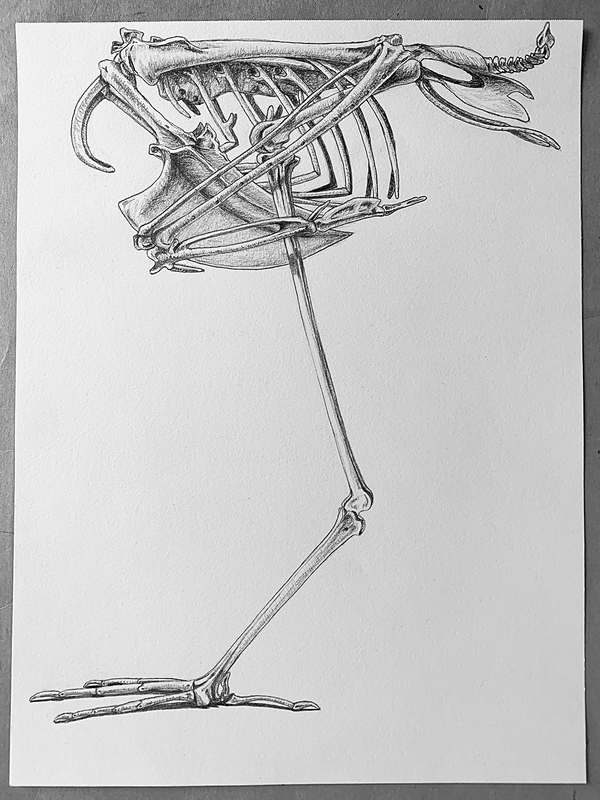 I partially and approximately re-drew it from Katrina van Grouw’s beautiful Glossy Ibis skeleton in her book The Unfeathered Bird. If you find bird skeletons intriguing, this book is must-see eye candy and wonderfully informative too. A while back, I posted a drawing of a feathered bird wing. 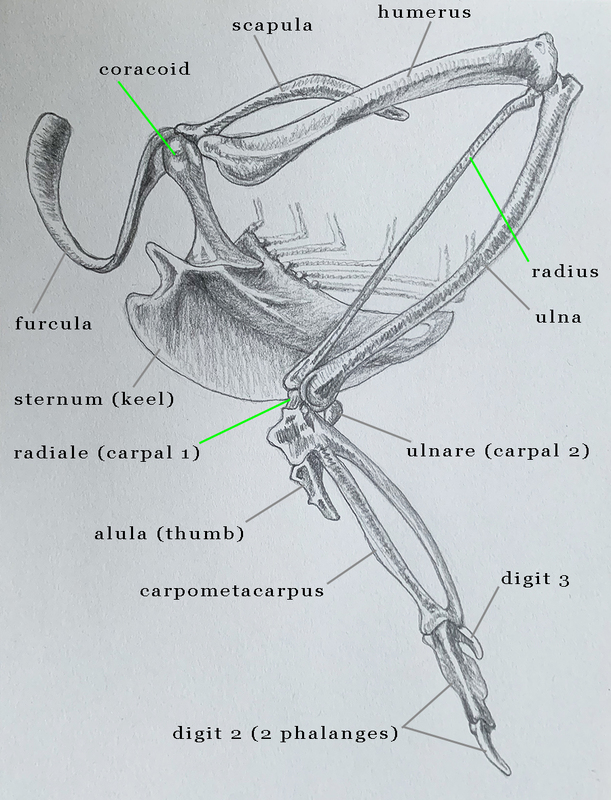 While doing research for that post, I learned that primary feathers are anchored to the hand bones of a bird’s arm (the carpometacarpus and digits 2 and 3) and secondary feathers are anchored to the ulna (pinky-side bone of the forearm). Which left me wondering, are there feathers anchored to the humerus? Tertials are anchored to the proximal end of the ulna, so they aren’t anchored to the humerus. Here and there, on the internet, I read about feathers called humerals. Are they anchored to the humerus? It turns out the answer is no. There are no feathers anchored to the humerus. But albatrosses and vultures have such long humerus bones, how do they fill that gap? Instead of attaching to bone, humerals attach to the wing skin that covers the humerus. 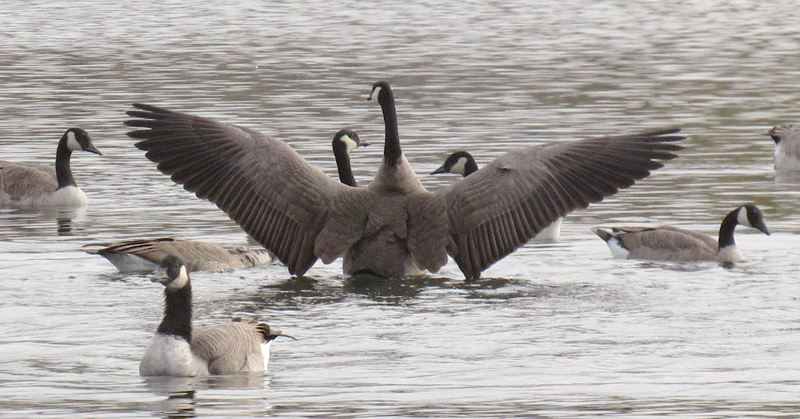 In birds with proportionally shorter humeri, the gap is filled by long scapular feathers (see goosey goose below). I labeled the arm bones on the Glossy Ibis skeleton but the ribcage and leg bones behind the arm make the arm bones a little tricky to see. 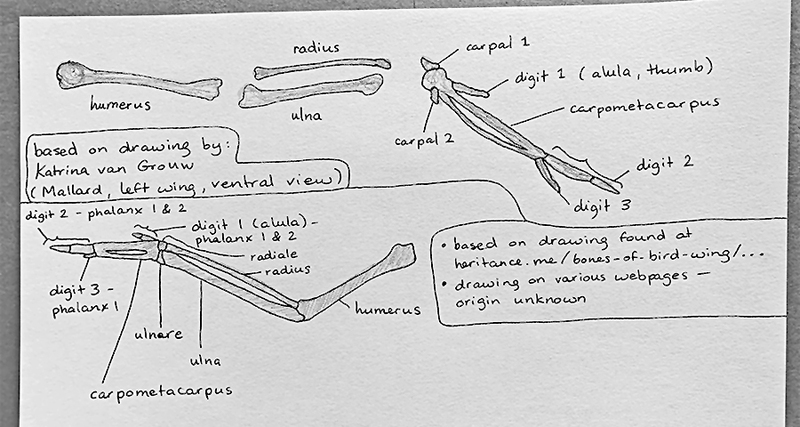 So I also labeled the arm bones of a Eurasian Sparrowhawk (also an approximate re-drawing from The Unfeathered Bird). My first drawings of wing bones were much simpler. They were a good basic introduction to the different bones and how they fit together. Afterwards, I used the simple drawings to help me identify the bones in Katrina van Grouw’s drawings of full bird skeletons. In vertebrates, like humans, metacarpals are the bones that make up the palm of the hand and carpals are wrist bones (birds have two, humans have more). Bird “palms” consist of one bone called the carpometacarpus, which is composed of fused carpals and metacarpals, hence the name. Birds have 3 fingers (digits 1, 2 and 3 or digits 2, 3 and 4… I don’t think researchers have answered that question yet… let’s assume 1, 2 and 3) – the alula or thumb (digit 1), digit 2 and digit 3. In general, digit 1 and 3 have one phalanx (individual finger bone) and digit 2 has 2 phalanges. Birds have 9 to 11 functional primary feathers. 6 or 7 of these attach to the carpometacarpus, one attaches to digit 3 and the rest attach to digit 2. Below are some drawings of human arm bones and shoulder joint bones for comparison. Sorry I did a particularly crappy job of shading the ulna and radius. Human arm bones. The olecranon is part of the ulna. Birds have 4 bones that join at the shoulder joint – the coracoid, furcula (wishbone), scapula and humerus. Humans only have 2 – the scapula and humerus. The coracoid process of the human scapula, which is an attachment site for several muscles and ligaments, is not homologous to the coracoid bone in birds. Another interesting difference between human and bird arms is that humans can extend their elbows 180 degrees whereas birds always have a bend in their elbow due to a tendon between their wrist and shoulder joint. This tendon forms the leading edge of a bird wing in flight, that slightly arced line between the shoulder and the wrist. 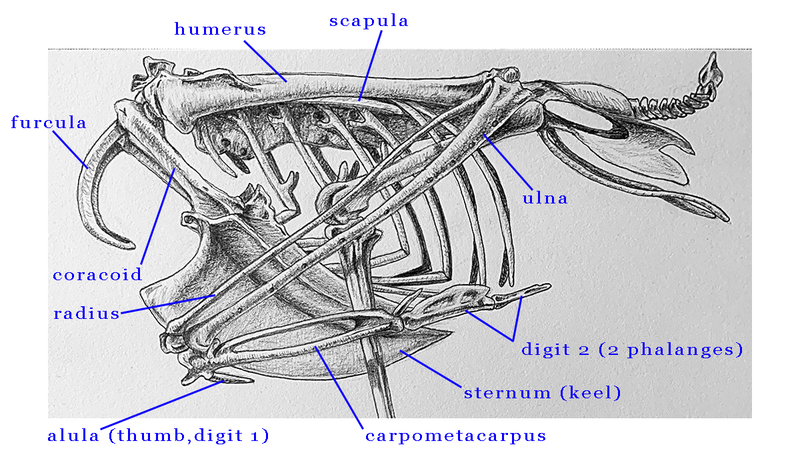 Here are the labeled arm bones of the Glossy Ibis. 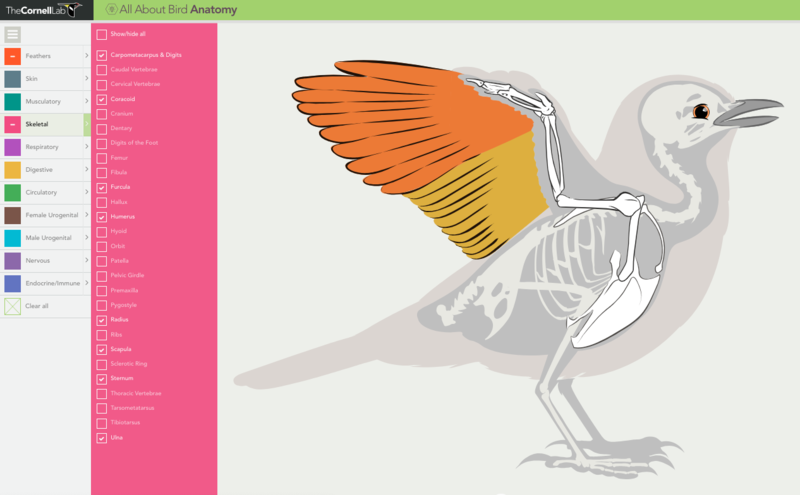 And if you want to have some bird anatomy fun, check out All About Bird Anatomy at the Cornell Lab of Ornithology. Thanks, Jean! 🙂 Happy to hear you are a bird skeleton appreciator. Your bird and bird nest drawings are wonderful! Thank you for this fascinating review of the upper extremity, Myr. Avian or human, it is a marvel of form and function. Love your drawings and the lesson on the wing bones of a bird! Excellent post! You’ve brought back memories of my early college days, drawing skeletons in both my biology class and my drawing class. It provides such a good foundation, doesn’t it? You did such a good job on your drawing. Thanks, Melissa :-). I’m so glad I brought back some good skeleton drawing memories. Some time next year, I’ll try drawing some bones from actual bones. I sometimes have questions about why animals have a certain shape and how that shape can become another shape. I often find the answer in skeletal and muscular structure. Those structures definitely help me make sense of what I’m seeing and trying to draw. Definitely. When I attended classes at my local junior college they had cases full of skeletons I could draw from. When I was teaching my daughter to draw the college was in the throes of a huge remodel and the bones were nowhere to be found. I hope when the project is finished they will resurface. They were such a nice resource.